Before we get into synchronization, let's talk about nodes and the master configuration. The master configuration is a collection of XML files that contain all sorts of information about a cell, such as the security settings and the applications in the cell. 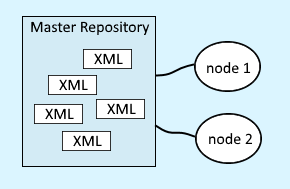 A node contains one or more WebSphere application servers. 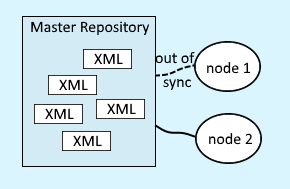 When a managed nodes is federated into the dmgr, the node needs to be synchronized with the master configuration so that the node is using the dmgr configuration. Let's consider a common example. You make some change in the WebSphere admin console, and you are presented wit the Save option. Selecting save updates the master configuration. This will cause the node to be out of sync with the master configuration. 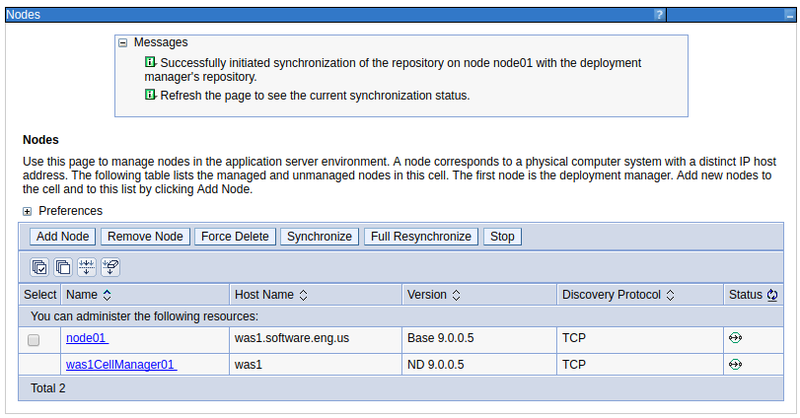 To know if a node is synchronize, in the left panel of the WebSphere admin console, select System administration > Nodes. In this example, AppSrv01Node01 is out of sync. Typically, there is no need to get involved and manually synchronize the node with the master configuration. The synchronization will happen automagically, typically less than 60 seconds after the master configuration is updated. However, you most certainly can manually synchronize the node with the master configuration. I usually do this when other engineer's are waiting on me. To manually synchronize, at System administration > Nodes, check each node that is out of sync, and select Synchronize. Or, you can use the syncNode.sh (Linux) or syncNode.bat (Windows) commands (more on this in a moment). You usually don't need to look at the logs. The status in the dmgr will almost always suffice. However, if a node just won't sync, knowing what logs to check is very helfpul. When an attempt is made to sychronize, the following event will be in the dmgr SystemOut.log. The following events will be in the application server syncNode.log. ADMS0003I: The configuration synchronization completed successfully. Notice there are two types of synchronizations. With a partial synchronization, only files that the deployment manager thinks have changed will be synchronized. A partial synchronization takes less time than a full synchronization. In the left panel of the WebSphere web console, expand System administration. Check the node that you would like to sync, and select Synchronize. After selecting Synchronize, message "successfully initiated synchronization" should be displayed. The managed node can also be synchronized using the syncNode.sh (Linux) or syncNode.bat (Windows) command. You will run this command from the server that contains the node that you want to sync with the deployment manager. Before issuing the syncNode.sh / syncNode.bat command, you will need to issue the stopNode.sh / stopNode.bat command. Once the node has been stopped, you can then issue the syncNode.sh command. In this example, "example.com" is the hostname of the deployment manager, and 8879 is the SOAP port of the deployment manager. 8879 is the default SOAP port. To be absolutely certain that you have the correct port, check the was_home/profiles/your_profile/properties/portdef.props file on the dmgr. After the node has been sycned, start the node. The managed node can also be synchronized using wsadmin. In this example, a variable named myNode which is associated with Node01, and then the node is synchronized. With a full synchronization, all file will be synchronized. A full synchronization takes more time than a partial synchronization. Check the node that you would like to sync, and select Full Resynchronize. Checkpoints can be created so that you can roll back to a prior version of the master repository if something goes awry.